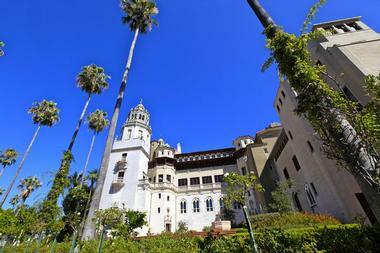 Hearst Castle, a National Historic Landmark, is a mansion located along California's Central Coast. It became a California State Park in 1954, formally being the residence of William Randolph Hearst. The newspaper magnate's home was formally called "La Cuesta Encantada," or "The Enchanted Hill." However, he usually called the estate "the ranch." The Hearst Castle's Casa Grande contains 115 rooms, including the Kitchen, Butler's Pantry, Staff Dining Room, the Reflectory, the Theater, the Billiard Room, Gothic Study, Library, and Beauty Salon. The castle's Guest Houses are made up of 46 rooms including lobbies. Construction of the Neptune Pool, the first of the two pools within Hearst Castle, lasted from 1924 to 1936. The first set of plans for the pool called for a "Temple Garden" that contained a temple structure and an ornamental pool. The second set of plans was created in 1926-1927. These plans called for a substantial enlargement of the pool and featured the Cascade at the southern side, a series of concrete steps down which water flowed. Now installed in the temple pediment, the Neptune and Nereid statues then stood at the top of the Cascade. The current version of the Neptune Pool was constructed from 1934 to 1936. This version that is present at Hearst Castle today is 58 feet wide, 95 feet at the alcove, and 104 feet long. Additional special aspects of the Neptune Pool include four Italian bas-reliefs from the seventeenth century along the sides of the colonnades, light-veined Vermont marble that decorates the colonnades and the pools, and the oil burning heating system. The Neptune Pool contains 345 thousand gallons of water. The depth of the pool ranges from three and a half feet to ten feet, reaching six feet in the alcove. The indoor Roman Pool, built from 1927 to 1934 is a tiled pool adorned with eight statues of gods, goddesses, and heroes of ancient Rome. The water in the pool was heated as in a tepidarium. This pool seems to be inspired by an ancient Roman bath, such as the Baths of Caracalla in Rome. The Roman Pool is decorated with one-inch mosaic tiles from floor to ceiling. The patterns of the mosaic tiles were modeled after the mosaics of Ravenna, Italy's fifth century Mausoleum of Galla Placidia. These tiles are either clear with fused gold inside or colored, mostly orange or blue. A breathtaking effect is created by the combination of the shimmering gold and intense colors of the mosaic tiles. The roofs and dome are also decorated with mosaic tiles of night blue, powdered with stars. 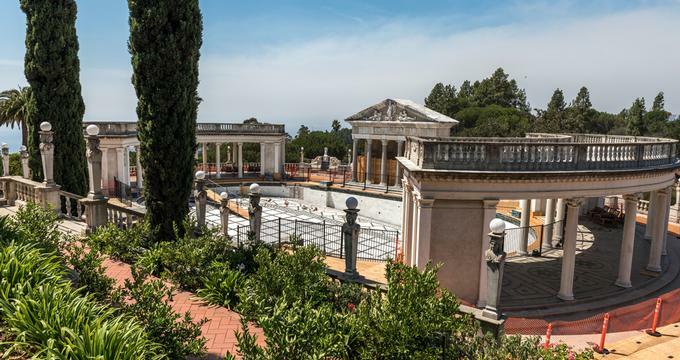 The statues found at the Roman Pool of Hearst Castle are rough replicas of statues from ancient Rome and Greece. Statues were used considerably often in the Baths of Caracalla. The Roman Pool contains 205 thousand gallons of water. The depth of the pool is ten feet, reaching a depth of four feet in the alcove. The wine cellar of Hearst Castle, CA, was home to the fine collection of spirits and wines belonging to Hearst. His collection even existed during the Prohibition Era. Located in the basement of Casa Grande, the cellar includes two rooms with double vault doors. Over 9,000 square feet of separate basement rooms were built as additions were made to Casa Grande. The majority of these rooms were used for storage. The wine cellar, located in the north end below the Assembly Room, is inconveniently located with regards to the kitchen. The placement of the cellar, however, was mostly likely chosen for the even, cool temperature that's needed to store wine correctly. In 1924, the wine cellar's wooden doors were replaced with iron doors. Hearst was worried about thievery, which is probably why he wanted the iron doors. During the Prohibition Era, 1920 to 1933, Hearst's guests continued to receive alcohol during their stay. W.R. Hearst was not a heavy drinker, and consumed mostly just beer or wine. He wasn't a fan of heavy drinking or hard liquor. His guests were not allowed to bring alcohol of their own, although some did. If a guest got drunk, they would be asked to leave and Hearst would have them driven to the train station. During Hearst's time, the area was not the wine-producing area it is today. The grapes grown in San Luis Obispo County were used only for eating, and Hearst never showed a desire to create wine as far as is known. During his time, the finest wine was from Germany and France, and this is represented in Hearst's collection of wine. The private art collection of W. R. Hearst can be viewed throughout Hearst Castle's beautiful interior and grounds. In addition to being Hearst's beloved hilltop retreat, The Enchanted Hill was a living museum that displayed his outstanding Mediterranean and European Hearst Castle art collection. This collection of art can be seen today in almost every inch of the historic mansion. Visitors can look through selected artwork on the Hearst Castle website before their visit. Visitors have the opportunity to learn more about how the tours and guided programs of Hearst Castle came to be with the history of Hearst Castle Tour Programs. Among approximately 5,000 historic house museums in the county, the castle is one of the largest. The history of the estate and the Hearst family is explained during the historic museum tours, as well as an illumination of the architecture, gardens, collection, and lifestyle at Hearst Castle. The Origins of the Hearst Castle tours explains how tours started at the castle. In 1952, UC Berkeley's President Sproul proposed that Hearst's residence be given as a historic monument to the Division of Beaches and Parks. Trial tours of the castle began in September 1952, lasted over two hours but were quickly shortened to one hour. Public tours began on June 2, 1958 after dedication ceremonies for the Hearst San Simeon State Historical Monument. At the time, there was only one tour that covered one of the guesthouses and the Casa Grande's first floor rooms. Due to an overwhelming response, additional tours were eventually offered. Now there are three different day tour routes, each guiding visitors through different areas of the museum and estate. The Accessibly Designed Grand Rooms Tour was added in 1974. The public expressed an interest in visiting Hearst Castle at night throughout the years. As a result, the Evening Tour was created in 1989. The goal of the program is to recreate an evening at the castle in the 1930's. The tour emphasizes the social history from 1930 to 1935, particularly on guests and employees of W. R. Hearst. Dressed in period clothing, Docents in the Living History Program illustrate the social history explained during the tour. 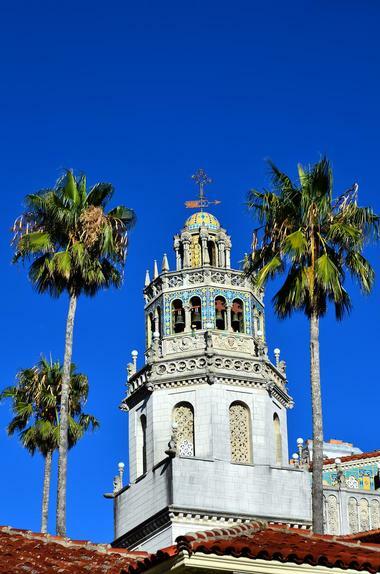 The Hearst Castle tours provide visitors with an opportunity to see what life was like as a guest of William Randolph Hearst, as well as a chance to explore his private collection of ancient and rare works of art. Visitors can experience the beauty of the historical mansion first-hand with a guided tour, including accessibly designed tours. The Grand Rooms Tour, the first tour developed for Hearst Castle, is recommended for those visiting the estate for the first time. The tour gathers in the grand social rooms of the castle's largest house, Casa Grande. The Grand Rooms Tour has the least amount of stairs to climb. Casa Grande's upper floors are explored in the Upstairs Suites Tour. During the tour, visitors climb the winding staircases to experience how William Randolph Hearst and his guests lived at Hearst Castle. The Cottages and Kitchen Tour explores a handful of the most personal rooms of the estate, as well as some of the most practical rooms. The industrial-sized kitchen and Hearst's beloved Casa del Mar are included in this tour. The Hearst Castle Evening Tour, offered during the spring and fall, allows visitors to experience the historic mansion during the evening hours. This tour takes visitors back in time as staff and guests dress in 1930's period clothing, and wander throughout Hearst Castle as part of the Living History Program. The Designing the Dream Tour focuses on the design and construction of the Enchanted Hill, exploring the development of the historic estate from the 1920s to the final touches in the 1940's. 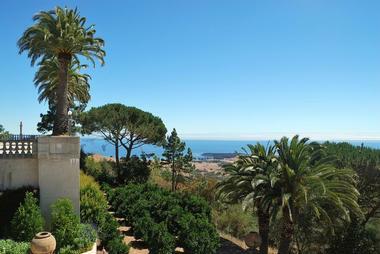 Hearst Castle is the only California State Park accredited by the American Alliance of Museums as an art museum. The Art of San Simeon Tour explores the works of art at the castle. The castle's Holiday Twilight Tour invites visitors to experience numerous holiday decoration abundant with Christmas trees, including a unique poinsettia tree and two towering trees. Hearst Castle also offers several different tours for schools and group, as well a private tour option for up to six people. Visitors are allowed to stay on the hilltop between and after the day tours to explore the gardens and pools at their own pace.